My last post here was in February. But I’ve posted lots of blogs since then…in my head. They’ve been really good, captivating, thought-provoking. Some of them are controversial. Some are funny. In my head! – at work – doing laundry – in the middle of the night – driving – etc. * I’m writing a cookbook. * I just spent over a week being very sick – lost seven pounds in three days. At one point, I was so weak it took all my strength to send a text to my son, asking for Ginger Ale. No lie. * Just finished reading an incredible set of books – the Refiner’s Fire series by Lynn Austin – historical novels set in the Civil War era. I am considering doing a review on them. I just can’t stop thinking about them…such has been their impact on me. * I want a vegetable garden this year. * My iris’ are up. My lillies are up. My bleeding heart is bushing out. 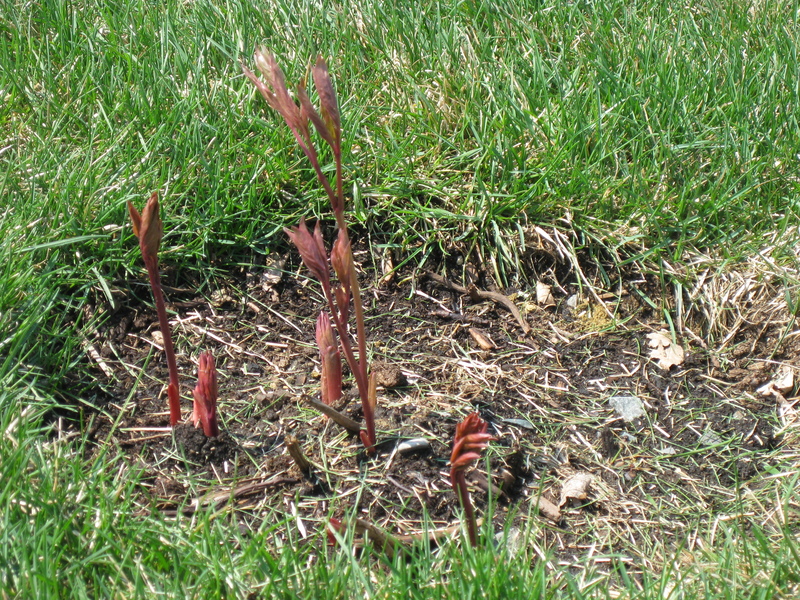 Even my peonies are sprouting. * I am seriously considering starting another (separate) blog for mothers of boys. * Our nation needs to turn back to God. It is critically evident that we were not brought into existence to operate successfully apart from Christ. * Am I ready for Jesus’ return? I told you it was random. Lately I’ve been receiving prods to create a blog on decorating. I think it would be fun – and I just might do it. But, whether or not that happens, I just have to share this wonderful 4th-of-July/summer decor find, fresh from my morning’s excursion to Goodwill (which was a self-granted reward for going to the gym two days in a row). 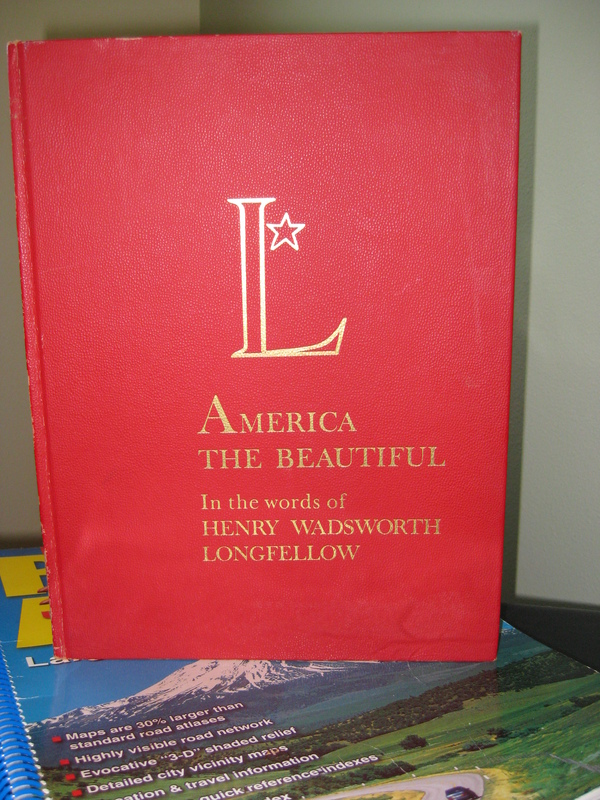 It’s a 45-year old edition of America the Beautiful – In the words of Henry Wadsworth Longfellow. Great red cover! Glittery gold lettering! And a star! Very 4th of July-ish, don’t you think? 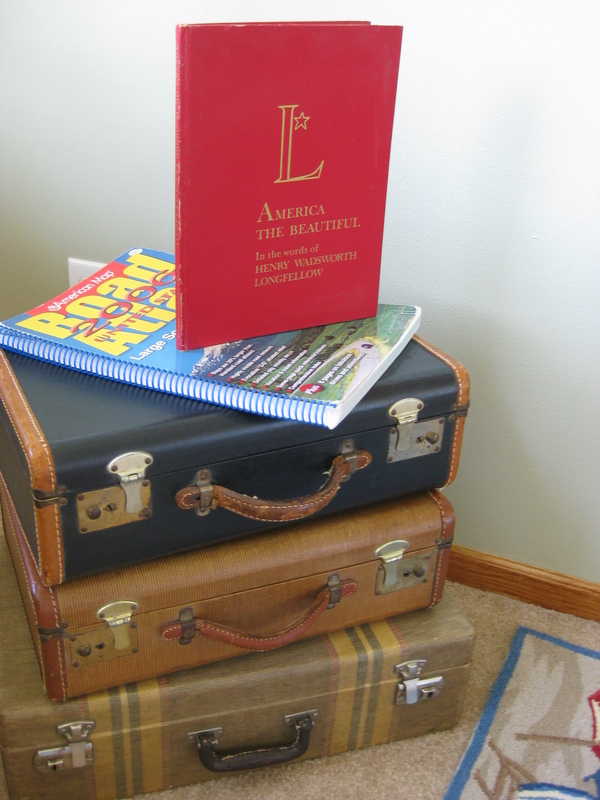 Perched atop a stack of vintage suitcases and a road atlas seemed to be the perfect spot for it. And I will read it. My father-in-law, who is 87, is an enviable gardener. Last fall, he shared with me some bulbs – lily, iris, phlox – and some peony sprouts. I was thrilled – especially about the peonies – which are heirloom plants brought from Norway by his grandmother (or was it great-grandmother? ), about 100 years ago. I managed to get all the bulbs planted but not the peony roots. They needed a different spot in the yard. A brand new place. My hero had great intentions of removing sod and preparing a great place for them. But because his job demanded enormous amounts of overtime, he just couldn’t get to it. Weeks passed, pushing us into late fall. In desperation, I finally decided I’d do it myself. I was soon shocked to discover I had neither the strength nor the tools to cut through sod, much less, prepare five holes, each a foot wide and a foot deep, as I’d been instructed by a peony expert whom I’d phoned for advice while in that state of desperation. I should probably mention that I did manage to dig one hole – almost deep enough. I’d started late in the day but decided I should probably stop digging when our neighbor backed into his driveway and just sat there with his truck headlights beaming at me…digging a hole in my yard in the dark. Which turned out to be a good thing for another reason. The next day, as my college-age son and his friend sat eating my home cooking, I asked the friend if he would be willing to dig holes in our yard, for pay. He agreed but in a follow-up phone conversation, he suggested I first call and have our yard marked for underground wires, etc. You know – the “Call Before You Dig” advice. So I did. I called. A few days later, I saw little wires with colored flags marking varying spots in my yard. And red lines sprayed in the grass, directly across the hole I’d begun digging. Finally, on a frigid, windy, rainy November day, the young man I hired, and our son, not only dug the holes, they mixed in the compost I’d lugged home. And, with my guidance, planted the peony roots. It had been weeks since I’d received those heirloom starters from my father-in-law and I was more than worried they may not sprout. But now it’s spring. April. And I am so stoked to see they’ve come up! And the young man, one of my “sons,” who incidentally turned down my pay, is now in another state beginning training to be a Navy Seal. 1.) How much time do I spend reading blogs, compared to the amount of time I spend reading the Bible? 2.) Is there any value to writing a blog? More specifically, is there any value to my blog? 3.) Am I called by God to write a blog, or is it just a time waster filler? 4.) Does my life center more on cyber-relationships connections, than on people who are clearly in my path – i.e. neighbors, friends, relatives, and strangers I run into in daily life – such as store clerks, etc.? I wonder if anyone else wonders these things. I think some of my marbles are missing. So I’m taking some time off to find them. You can still reach me by leaving comments. I’ll be checking my email from time to time and will see them there.